Never one to question where fate leads him, Dhalsim finds himself invited to yet another Street Fighter tournament. He enters in order to continue raising money for the poor members of his village. He arrives to the first tournament as a late entry along with a school girl from Japan, much to Dhalsim's surprise. 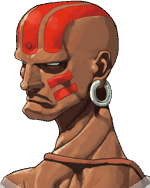 Dhalsim fully participates in the second EX tournament, where he is arranged to fight a fearsome fighter from Brazil. When Dhalsim sees Blanka for the first time, he is surprised to find a child-like wonder in the eyes of what otherwise appears to be a gruesome beast. Dhalsim holds back a bit of his power and invites Blanka to hone his skill in combat against Dhalsim. At the end of the fight, Blanka is surprised to receive Dhalsim's hand in congratulations for a wonderful fight. At that point, Blanka gains instant admiration for a fighter who didn't dismiss him on the basis of his looks. When the third EX tournament is announced, Dhalsim wonders who he might ask to be a partner with him when Blanka shows up, having flown all the way to India (by hanging on to the tail of an airplane) just to ask him to be his partner. Dhalsim graciously accepts. This page was last edited on 28 November 2007, at 19:07.